Built in 1927 the McPherson Community Building is significant for its association with McPherson's entertainment and recreation history. Best remembered as the homecourt of the Gold Refiners, the building houses a gymnasium and a theater and provided space for the city’s first fire department. The Globe Refiners provided five team members to the 1936 US Olympic Basketball Team, who won the first gold medal awarded for basketball. The building served the community of McPherson as a gathering place for basketball games and plays, and until circa 1963, housed the city's fire department. The period of significance spans from the building's construction in 1927 to circa 1963 when the fire department moved out of the building, ending the continued historic use of this building. Swedish immigrant P.J. Lindquist commissioned the construction of this building in 1901 to house his tailor shop and an upper-floor living space. That year, Lindsborg led other McPherson County towns in investment in new commercial and residential building. Although the tailor shop was short-lived, the Lindquist family owned the building for 39 years. The family lived in the second-floor apartment for many years, apparently after closing the tailor shop. Other businesses, such as the Tea Cup Inn, subsequently occupied the commercial space. The Malm Brothers Painting Company, reportedly packed and shipped stencils from this building, and this remains under investigation. One interior wall provides a vibrant stencil sample that may be the work of local artist Oscar Gunnarson, a partner in the Malm Company. 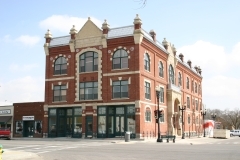 The building is an excellent example of an early 20th century commercial building distinguished by Italianate-style details including the cast-iron storefront and tall second-story windows with ornate metal hoods. 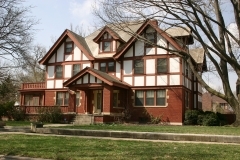 Although the building has housed multiple tenants on both floors over the years, it retains a high degree of integrity. 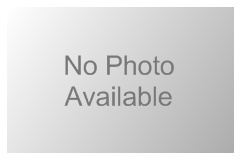 It was nominated for its local significance in the areas of commerce and architecture. McPherson was founded in 1872 and rapidly grew with the expansion of the Santa Fe and Union Pacific Railroads into a community with industry, business, and entertainment. This growth relied on power. Using coal for fuel, the Power Plant #1 (1934-1947) produced steam power. By 1927, the plant had converted to oil as its source of fuel. 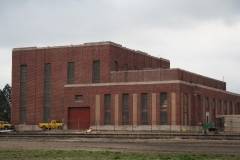 The architectural firms of Burns and McDonnell Engineering of Kansas City and Laramore and Douglass, Inc. of Chicago designed the power plant. It is nominated for its architectural significance as a good example of the Art Deco style executed on an industrial building. The Red Barn Craft Studio is an assortment of interconnected buildings and sheds that artist Lester Wilmer Raymer used as his studio and residence for more than 45 years. 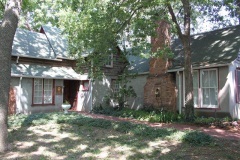 The property, which later became known as simply the Red Barn Studio, served as his art studio, gallery, and residence from 1945 to 1991, and it continues to function as a gallery and museum dedicated to Raymer's art. During the years Raymer was associated with the property, he remodeled and transformed the early 20th century buildings using recycled materials and the result is a unique property that very much a displays Raymer's folk art abilities and his evolving skill of working with a variety of mediums. The period of significance begins with Raymer's acquisition of the property in 1945 and extends to 1975, with the last of his major exterior renovations to the property. In addition to the sprawling studio, the property includes an early 20th century residence, a free-standing one-car garage, and a shed. 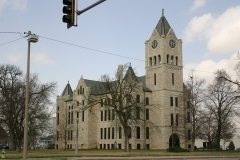 It was nominated to the Register of Historic Kansas Places for its association with artist Lester Raymer and for its expression of Raymer's artistic abilities. 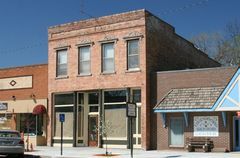 The Rosberg-Holmgren-Clareen Block is an excellent intact representative of the early permanent commercial structures constructed by Swedish immigrants on Lindsborg’s Main Street. 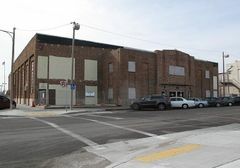 Between these three nearly identical buildings were numerous enterprises, most of which were family businesses that served Lindsborg residents for decades and provided essential goods and services. The business owners were pillars of the community. Albert Train and C.V. Rosberg were members of the Commercial Club (precursor to the Chamber of Commerce); Train was also a member of the fire company. Rosberg was a city councilman; the Train family helped found the Bethany Church. Rosberg, Train, Runbeck, and Peterson were multi-generation business owners and all were first or second generation immigrants. The three buildings are excellent examples of a Commercial Style building with Italianate detailing distinguished by their brick corbelling, ornate metal window hoods, cast-iron storefront columns, and wood-framed transoms. This nomination expanded and amended the nomination of the Clareen/Peterson Restaurant Building that was individually listed in the National Register on April 22, 2009.